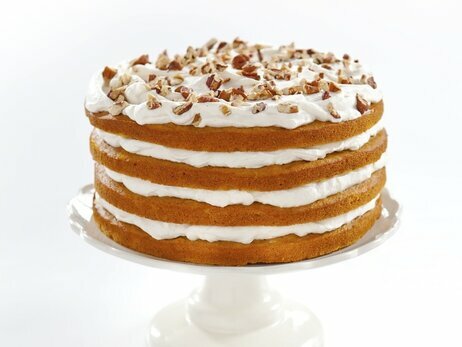 I had to post this “day after” pumpkin cake recipe, because it just seems too perfect. It looks easy to prepare, so for all you novice bakers, this is your cake! I got the recipe from Chris Kimball, host of the PBS show America’s Test Kitchen, via an NPR. Check out the link here for more fall recipes. Adjust oven rack to middle position and heat oven to 350 degrees. Grease two 8-inch round cake pans, line with parchment paper. Grease parchment and flour pans. Whisk flour, pumpkin pie spice, baking powder, baking soda, and salt together in bowl. Using stand mixer fitted with paddle, beat sugar, butter, and eggs on medium-high speed until pale and fluffy, about 3 minutes. Reduce speed to low, add pumpkin, and mix until incorporated. Slowly add flour mixture and mix until only few small flour streaks remain, about 30 seconds. Spread one-fourth of batter (about 1 cup) in even layer in each prepared pan. Bake until toothpick inserted in center comes out clean, 12 to 14 minutes. Let cool on wire rack for 10 minutes. Invert each cake onto large plate, peel off parchment, and invert again onto lightly greased rack. Cool completely. Reprep pans and repeat with remaining batter. Using dry, clean bowl and whisk attachment, whip cream and maple syrup together on medium speed until stiff peaks form, about 3 minutes. Place 1 cake layer on cake plate or pedestal, then spread one-fourth of whipped cream (scant cup) evenly over top. Repeat with remaining cake layers and whipped cream. Sprinkle pecans on top and serve.